The DGL portable deglazing machine is designed for precision deglazing at in-situ applications. 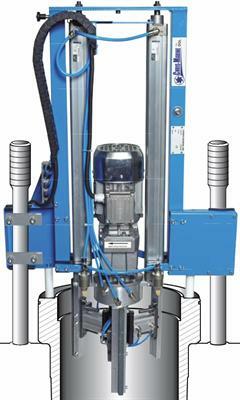 The machine is set up within minutes, being easily mounted on stud bolts and self-centering on the cylinder liner. The three-armed head is equipped with interchangeable stone holders and air cylinders for correct and adjustable stone pressure. The electrically driven DGL comes in two versions, the SE version sporting the single engine and the ME with multiple engines for adjustable stroke length.